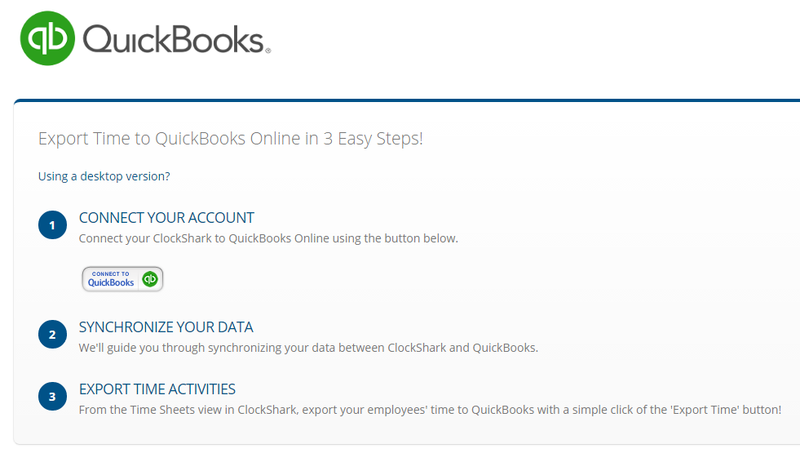 Connecting ClockShark to QuickBooks Online takes just a few minutes and provides powerful synchronization and time export capabilities. Once connected to QuickBooks Online, your ClockShark Jobs, Tasks, and Employees can be synchronized automatically or manually with your QuickBooks Online Customer/Jobs, Service Items, and Employees. You can also export your time activities from ClockShark to QuickBooks Online in seconds, by simply pressing the Export Time to QuickBooks button on the ClockShark Time Sheets Screen. 1. Go to the Admin Menu and select QuickBooks from the menu. 2. Follow the simple on screen instructions to connect to QuickBooks Online. 3. Once connected to QuickBooks Online, ClockShark will ask you to map any existing ClockShark Tasks, Jobs and Employees to any existing QuickBooks Service Items, Customer/Jobs, and Employees. Creating these mappings allows ClockShark to export your time activities from ClockShark to the correct corresponding QuickBooks Service Items, Customer/Jobs, and Employees. 4. Once you've created your mappings you are ready to export time from ClockShark to QuickBooks Online. To export time, go to the Time Sheets Screen in ClockShark for the week you want to export and click the Export to QuickBooks button. 5. 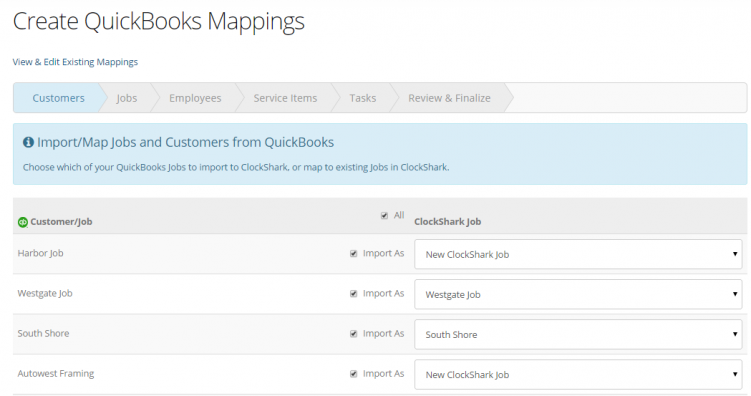 Newly added ClockShark Jobs and Tasks can be automatically added to (and mapped to) QuickBooks Online using the Auto-Map Feature. The Auto-Map Feature can be turned on via your QuickBooks settings screen which can be accessed from the Admin Menu as Admin > QuickBooks. Alternatively, you can set the Auto-Map Feature to work in the opposite direction. This opposite direction is ideal if you prefer to create your new Customer/Jobs and Service Items in QuickBooks Online then have them added to (and mapped to) ClockShark automatically as new Jobs and Tasks. Regardless of the direction you choose for Auto-Map, your new entries will be mapped automatically once per hour. If you need an entry mapped sooner, you can map an entry manually at any time by visiting the Create New Mappings Screen. Note- Employees cannot be automatically mapped due to limitations in ClockShark's ability to create new employees in QuickBooks. It is recommended that new employees be created in QuickBooks, then mapped into ClockShark using the Create New Mappings Screen. 6. You can change your QuickBooks Online Integration Settings at any time by visiting the Admin Menu and selecting QuickBooks (Admin > QuickBooks). That's all there is to integrating ClockShark's powerful time tracking capabilities with QuickBooks Online's awesome accounting and payroll capabilities. Wow, your business just got more automated!